In my family, growing up, Buckeyes have always played a significant role in our Christmas traditions. This year, I came across a recipe by Kraft for Buckeye bars. Not really having the time to roll buckeye balls and deal with a ton of ingredients, I decided to give this recipe a shot. SO easy. The whole thing took less than 15 minutes to put together and it's chillin in the fridge even as I type this. 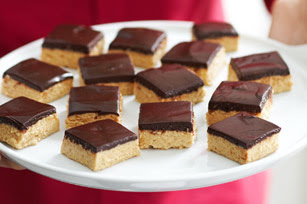 Gracing our dessert plates this Christmas day will be these fabulous Buckeye Bars! WOOHOO! I wanted to try my hand at breading something. Honestly, I don't have much experience with doing it, so I tried to find the easiest recipe I could get my hands on to try. It was super easy to make, not nearly as messy as I thought it was going to be, and it was SUPER tasty. We're definitely making this again. The chicken breasts came out very flat and easy to roll. Try it! I'm sure you can find a thick textbook of your own to use. Pound chicken breast to 1/4-inch thickness. Sprinkle each piece on both sides with salt and pepper. Place 1 cheese slice and 1 ham slice on each breast. Roll up each breast using toothpicks to secure if necessary. Dredge each in flour, shake off excess, then in egg and finally in bread crumbs. Place seam side down in baking dish that has been sprayed with Pam. Place 1 tablespoon butter on each piece of chicken.Bake at 350°F for 40-45 minutes until juices run clear. Comfort food at its very best. It's December now...time to warm up! Cup up green pepper, onion and mix in with beef. Pour in tomato juice, diced tomatoes, and rotini. Simmer/Cook on low to medium heat for 45 minutes or until noodles are tender. Sprinkle parmesan cheese on top and serve. Ok...first off, let me just say that I know Spam isn't necessarily everyone's "cup of tea." But here in Minnesota, where it originated, I know plenty of Spam lovers. And as they say..."Don't knock it till you've tried it." I was a wee bit skeptical at first of this dish, as I felt the ingredients together were a bit strange, but surprisingly, it was REALLY GOOD. 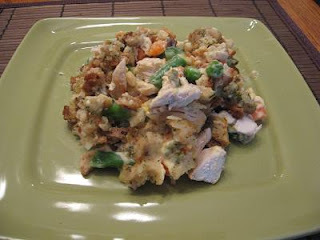 It's a very very creamy casserole/hot dish and we will definitely have it again. And it's incredibly cheap to prepare as well. 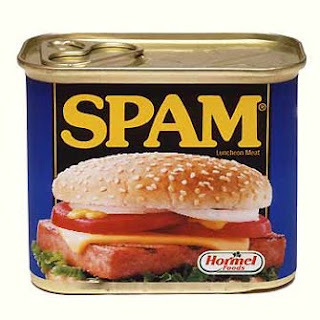 So Spam lovers...here ya go! In a large bowl, combine all ingredients; mix well. Pour mixture into a 2-quart baking dish. Bake for 1 hour. Serves 4 to 6. This is my very first "MN Hotdish" out of my new cookbook that arrived on my doorstep 2 days ago! 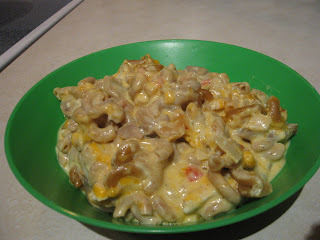 This one in particular caught my eye for 1 main reason...it's mac & cheese. 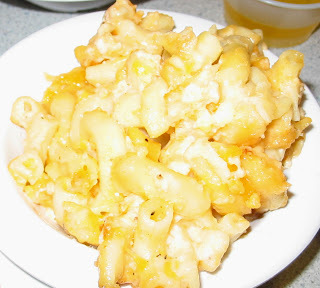 Mac & cheese is theme on this blog, or has been in the past, so I'm always looking for new ways to "jazz up" the good old comfort food main-stay. This new recipe definitely didn't disappoint. In fact, you'd only be letting yourself down if you don't try it! Place all ingredients into a 2-quart glass baking dish; mix. Cover and bake about 1 hour or until macaroni test done. Serves 4. Yep. You really don't cook the macaroni first. I'm serious! Enjoy! I got this recipe from my friend, Ashley, as she tried it a couple weeks ago and loved it. Knowing that I'm just a wee bit obsessed with cooking and trying out new recipes, she sent it to me and I immediately added it to the weekly menu. The soup is kind of a "rip off" of the soup at Olive Garden. I know Olive Garden has more vegetables in theirs, but trust me, this is just as good. And not to mention, ridiculously cheap to make. You can make a huge stock pot of this stuff for the price you'd pay for a bowl of it there. Check it out! So good on a chilly fall day! Thanks Ashley! 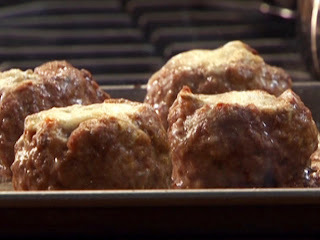 In a large saucepan, combine Italian sausage with chopped onion and minced garlic. 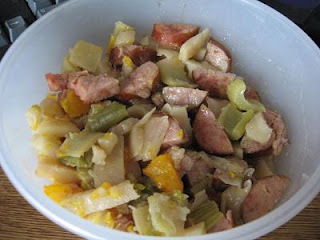 Cook until the sausage is almost entirely cooked through and the onion has softened. Drain and rinse both the kidney beans and the great northern beans. Add to the meat. Leave the tomatoes undrained and add all contents to the meat. Also add chicken broth, parsley, and basil. Heat to boiling. Reduce heat to medium-low; cover and simmer for 15 minutes, stirring occasionally. Remove cover; increase to heat to high. Heat to boiling. Add the macaroni; reduce heat to medium. Cook 10 to 15 minutes or until the pasta is al dente. A couple weeks ago, my best friend came over for a nice dinner with me and the hubs. I wanted to make something nice, but didn't really want a whole lotta fuss as I'd had a ridiculously busy week ahead of me as well. Luckily I'd just received my latest Kraft Food & Family magazine and there were a bazillion yummy dishes in there just ready to be made. I came across their Slow-Cooker Lasagna recipe and knew we had to try it. 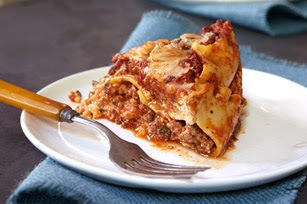 We love lasagna around here, but I never want to really take the time to make one. This recipe was made for people like me. Put it together, put it in the crock pot and walk away! Brown meat in large skillet; drain. Stir in spaghetti sauce and water. In a separate bowl, mix ricotta, 1-1/2 cups mozzarella, 2 Tbsp. Parmesan, egg and parsley. I came across this hot dish recipe in a gift shop at a local orchard recently and I knew I HAD to have it. "Hot dish" as we call it here in Minnesota, is the rest of the country's version of casserole. It's the essence of comfort food. I knew I could get it for way cheaper online, and lo and behold, I scored my own copy for only 75 cents + shipping on half.com. So once it arrives, I'm diving right in. 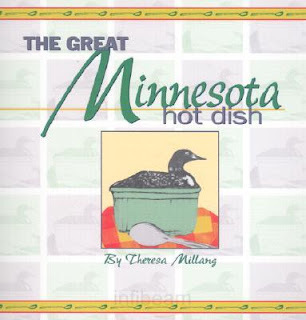 I hope to share some fabulous MN Hot dishes in the not-so-distant future with you all on here too! My mom sent me this recipe a long time ago and we just got around to making it. Most of the ingredients were just regular "staples" I had in my kitchen already, so going out and buying a ton of ingredients didn't happen to make this one. It was very good. I was a little concerned about the sausage as it seemed like kind of an odd pairing with the rest of the ingredients, but it turned out to be super yummy!! 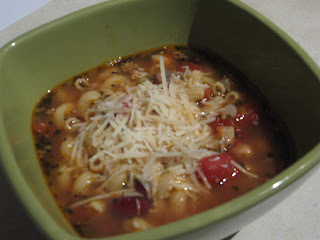 A very "hearty" meal, especially for cooler days! In a large skillet cook sausage and onion over medium heat until meat is no longer pink, drain. Add the corn, tomatoes, rice, salt and pepper. Bring to a boil. Reduce heat, cover and simmer for 10 minutes or until rice is tender. Sprinkle with cheddar and mozzarella cheese. Cook uncovered 5 minutes longer or until cheese melts. Yields 4 - 6 servings. I had a bunch of different ingredients and things lying around my kitchen and I decided to throw them all together and see what happened. The ultimate in comfort food. 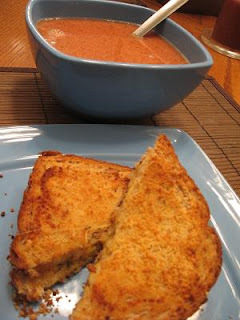 Perfect for a rainy day or a cold winter afternoon. 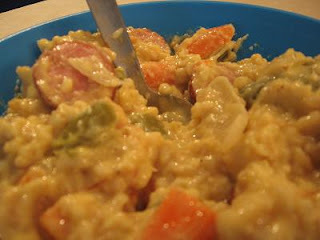 Put the green pepper, onion, carrot, and smoked sausage chunks into a large bowl. Add both cans of cream of celery soup, and half and half. Mix together. Add dried brown rice to mixture and stir. Then add pepper and stir again. Allow to cook in crock pot on high for 3 hours or low for 5 hours or until veggies are tender and rice is plumped up. Sorry for the bad picture. Hard to get a good one! From my Grandma...so you KNOW it's good. Brown hamburger with green onions and taco seasoning mix. Lay crescent rolls in a 9 x 13 pan and press together. Add refried beans to hamburger mixture and pour over crescent rolls. Put sliced black olives on top of meat mixture. Mix shredded cheese, sour cream and egg together. 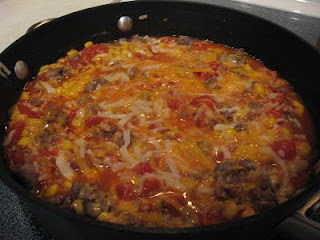 Pour on top of bean and hamburger mixture and bake at 375 degrees for 25 minutes. 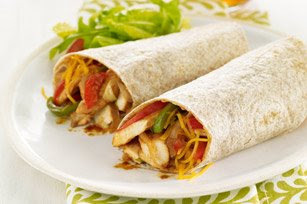 Sprinkle with shredded lettuce, black olives, chopped tomatoes and green onions when taken from the oven. Optional: Spoon meat mixture into bowls and let individuals put their own toppings on. I also topped with a mild salsa and a dollop of sour cream. Use whatever toppings you like. Enjoy! I got this recipe out of the latest Kraft Food & Family magazine. If you follow my blog, you know that I definitely live for my next edition of this mag to arrive in our mailbox. I especially love the summer editions as they tend to have a lot of great grilling ideas and fruity desserts. This particular wrap struck me as something I'd like to try. Mainly because I seem to have this slight obsession with BBQ sauce at the moment, and we had all the ingredients in our kitchen already in order to make it! An obvious choice, huh? We made it for a light supper on a Friday night after work and we both really enjoyed it. If you haven't checked out Kraft's Food & Family site, you're missing out! Cook and stir vegetables in large nonstick skillet on medium-high heat 3 min. Add chicken; cook and stir 3 to 4 min. or until no longer pink. Stir in barbecue sauce; cook on medium heat 3 min. or until chicken is done, stirring occasionally. Spoon chicken mixture down centers of tortillas; top with cheese. Roll up. Cut diagonally in half to serve. OK...this is my attempt at making a slightly "fancier" dish for me and the hubs to enjoy. Very very easy, a tad bit healthier due to the EVOO, whole wheat pasta, and spinach. 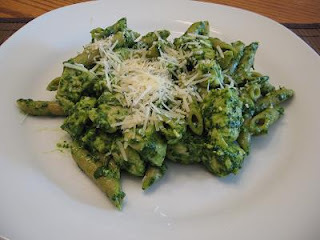 I took several different spinach pesto recipes I'd found (after being inspired by Rachel Ray), and created my own. It was my first attempt at pesto and I think I succeeded! Or at least my man seems to think so! Very good dinner tonight. Very good. Combine pine nuts & 2 cloves of garlic in food processor and process until chopped. Add spinach, 1/2 cup of parmesan cheese, 1/2 cup of oil, salt and spices. Process until well-blended. Cook penne rigate according to directions on stovetop. Drain. Drizzle remaining 1/4 cup of EVOO into pan and heat up. Toss in remaining 2 cloves of garlic into oil. Cut chicken into bite-sized pieces and add to pan. Cook until heated through or juices run clear. Drain any excess liquid that may remain. Toss noodles, and chicken together in a large bowl, adding the spinach pesto with it. Serve and top with shredded parmesan cheese! I have no idea where I got this recipe from. I stumbled across a ton of recipes on my computer that I completely forgot about! So of course we had to start making some this week in order to share the good ones with you all. This one my mom recently made as well and apparently it was a huge hit between her and dad! Dad went back for several helpings! 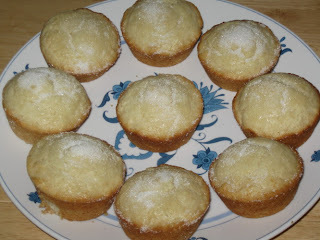 Super easy to make, very yummy. I concur. rice. Pour into large, greased casserole dish. Bake at 300 degrees for 45 minutes. I have acquired quite the taste for horseradish lately and have been on the lookout for some good horseradish dip or dressing recipes. I compiled a bunch of them and made up my own dip based upon recipe ingredient suggestions. I can officially tell you it's FABULOUS and would be the perfect addition to any sort of get together with friends paired along with some crackers of your choice. 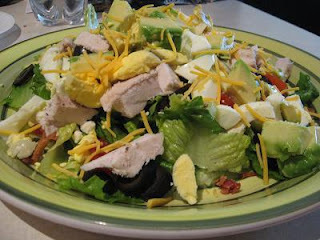 It would also be a wonderful choice of salad dressing should you choose to go that route. It has just the slightest hint of a "bite" to it! Mix all ingredients together. Refrigerate for at least 1 hour before eating. 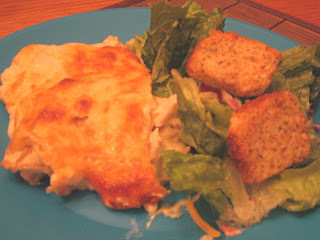 Serve over lettuce as a salad dressing or with crackers as a dip. 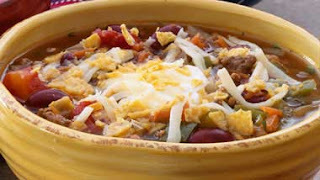 We have been making this soup for years after seeing it featured by one of our local news personalities, Tim M. Tim's Taco Soup is so easy to make and is honestly really good to have all year round. And sometimes I believe leftovers are even better...this might just be the case with this soup. I hope you enjoy it just as much as we do! In a large saucepan, cook meat and onion until meat is browned; drain. Add water, un-drained tomatoes, un-drained kidney beans, tomato sauce, and taco seasoning mix. Simmer, covered for 15 minutes-1 hour. Optional: serve soup over corn chips, and top with cheese, and sour creap. Chopped avocado can be added. Serves 8-12. Soup can be frozen. Additonal spices can be added, season to taste. A few weeks ago I was approached by Joyce, who is the author of "Oregon Mom's Empty Nest" as to whether or not I'd be interested in sharing one of my favorite recipes on her blog with her readers. Of course I jumped at the chance and my all-time favorite recipe...Smoked Sausage Jambalaya...was published this morning. Thank you again, Joyce for asking me to contribute. I was happy to. And to all my readers, please take a gander over to Joyce's website and check out her journal, garden page, and all the fabulous recipes she also has to share! I made this one up as I went, so you can feel free to adjust the ingredients as you go to fit your tastes. 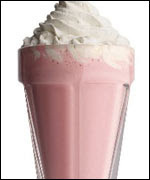 It's very creamy, and really "hit the spot" for my sweet tooth today! Mix first 4 ingredients together and pour into pie crust. Smooth out pie filling and refrigerate for 2 hours. Yet another easy one from my mom. Homemade, so easy, whip it up, throw it together, bake it, and enjoy. In a large bowl, beat eggs. Stir in the cheese, buttermilk, butter and salt. Add the macaroni and mix well. Pour into a greased 9 x 13 baking dish. Bake uncovered at 350 degrees for 45 - 50 mins. or until thermometer reads 160 degrees. Yields 8 - 10 Servings. Since it's no secret that I think THESE are the best burgers on the planet, I got the idea to try it as a little "twist" on a meatloaf. 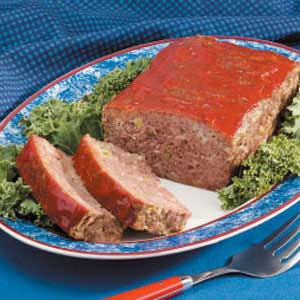 Double the recipe and you've got yourself a fab meatloaf, which is even good for sandwiches! Mix all ingredients together. Form into a loaf and bake at 350 degrees for 60 minutes or until heated through. Ok...what's not to like in this one? I mean seriously. Preheat oven to 450 degrees. Coat a large nonstick skillet with cooking spray. Heat over medium-high heat and add peppers, onion, garlic, seasoning mix and water. Saute 5 minutes or until vegetables are tender crisp. Remove from heat; stir in salsa and chicken. 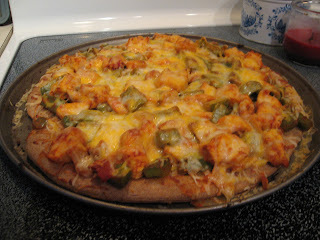 Arrange vegetable/chicken mixture over crust. Sprinkle with cheese. Bake 7-8 minutes or until pizza crust is crisp and cheese is melted. Makes 6 servings. My mom has made this for years and years and years. She usually doesn't do her's in the crockpot, but I thought I'd give it a try and see how it went. It's still as fabulous as I've always known it to be. Peel potato and cut up into large cubes. Cut smoked sausage into 1/2 inch pieces. Chop green peppers and onion into large chunks. Put all ingredients in the crock pot and drizzle 2 tbsp. of oil on top. Stir until mixed. Cook on low for 4-6 hours or until veggies/potatoes are tender and cooked through. Salt & pepper to taste. Makes 4 servings. You could also bake in a 9 x 13 pan for 45 minutes - an hour at 350. 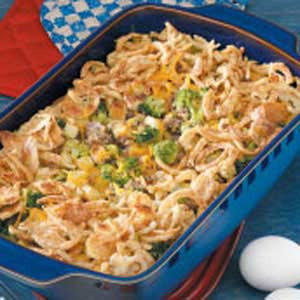 This is supposedly a casserole, but you could easily use this for breakfast as a sort of "egg bake." Mom sent this to me recently and man, it's DELISH! Cook broccoli according to pkg. directions, drain and set aside. In a lg. skillet, cook sausage over medium heat until the meat is no longer pink, drain. She didn't do her's in a crockpot, but rather in a 9 x 13 baking dish until heated through. I believe I'm going to go the crockpot route and see how that works. 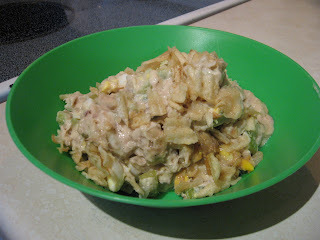 Stir together all ingredients except 1/2 cup potato chips in slow cooker, mix well. Sprinkle remaining 1/2 cup potato chips on top. Cover and cook on low 5 to 8 hours. Makes 8 servings. This one is an old favorite in my family and I believe my mom got this recipe from a friend of her's from church a loooooong time ago. 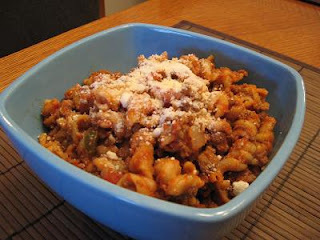 It makes a lot and the leftovers taste even better in my opinion! 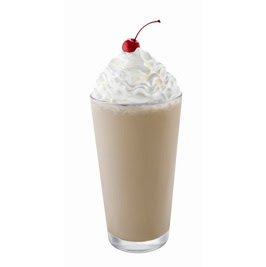 I'm making this tomorrow and should have a picture up for you soon. Prepare and cook rice. Cook onion in butter until tender. Remove from heat and stir in flour. Drain mushrooms, reserving the liquid. Add enough chicken broth to liquid to measure 1 1/2 cups. Gradually stir into flour mixture. Add half and half, cook and stir until thick. 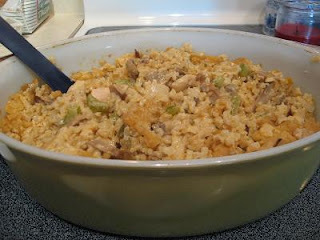 Add rice, chicken, mushrooms and seasonings. Place in 2 qt. casserole dish and sprinkle with almonds. 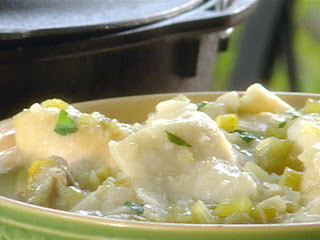 I had been looking for a relatively simple Chicken & Dumplings recipe for a while now and finally got this one from "jdseggar" off the nest.com's "What's Cooking" board. So easy, you probably have more than half the ingredients already around your house, it's minimal "fuss" and man...it's fab! Combine all ingredients, except biscuits, in crock pot. Cover and cook on low for 5 to 6 hours. 30 minutes before serving, tear biscuit dough into 1-inch pieces. Add to crock pot; stirring gently. Cover and cook on HIGH for an additional 30 minutes or until biscuits are fluffed up and cooked through. 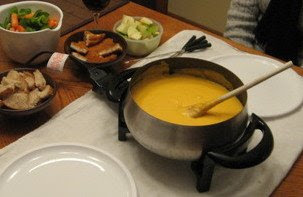 This is a very basic cheese fondue recipe that I got off Allrecipes.com. My husband and I are relatively new at the whole "fondue thing" but thought we'd give cheese a shot as we did oil fondue for New Year's Eve earlier this month. It was really very simple to make (probably done with it all in 15 minutes) and tasted great. We dipped veggies and french bread. It's VERY basic, you could add different spices and things to make it your own. Some people on allrecipes.com suggested adding a bit of beer to give it some more kick. We didn't do this. In a medium saucepan over low heat, mix together milk, Worcestershire sauce, ground dry mustard, garlic and flour. Heat until almost boiling. Gradually stir in Cheddar cheese. Continue heating until all the cheese has melted. Keep the mixture warm and melted in a fondue dish.